12/16/11: I placed an order for the Blast 30 backpack and a Multipack along with some other smaller items. I requested to receive the items by 1/10/12 for an expected trip. 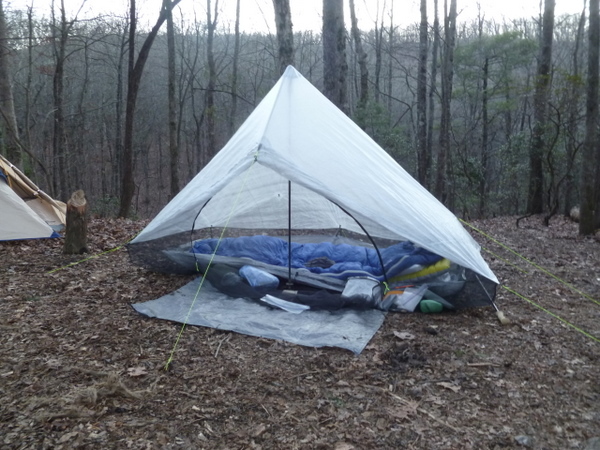 12/30/11 (approximately 6 pm): I placed an order with ZPacks for the Hexamid Solo Plus Tent with the beak and the cuben fiber solo plus LITE ground sheet, among a few other small items. I was fully aware that ZPacks was closed for the holidays and would not be back in until 1/2/12. However, I requested that if possible could this tent be shipped with my Blast 30 backpack by 1/10/12 for a trip I am leaving on. 12/31/12: Joe responds to my email and says that he has been away for holiday and has a lot to catch up on, but that he will shoot for the 10th for the tent. As well, he said my backpack would be ready to ship early that week separately. 1/2/12: Email confirming that pack would ship the next day, 1/3/12. 1/3/12: Backpack and all small items from both orders shipped. 1/5/12: Backpack and small items arrive. 1/6/12: Tent & ground sheet shipped. 1/9/12: Tent & ground sheet arrived. So, why did I say all of this? Because Joe rocks, that’s why! Before I placed my order for the Blast pack I made a video with the pack that John sent me and requested suggestions as to the way the pack fit. Joe viewed the video and responded to me. He was loads of help before ordering the pack as far as fit and options were concerned. As well, he told me that it shouldn’t be a problem to get the pack to me by the date requested! As for the tent, I found set-up to be quite easy. The no-knot thing makes it so. However, once getting it all staked out I did have to go back and pull each guy line back a little farther until I got them all the way I liked. Not a hassle, just readjusting the guylines once they were all staked down, as with most tents. Entry/exit. I address this (briefly) because I feel like it may be one of the things that people will point out as being less than ideal. Well, let me say that it is not a bit of problem for me. Ok, so I haven’t spent a night in it yet, so how do I know? Well, I have spent nights under my 8×10 OES sil tarp and I have had to enter/exit it about the same way. For me, it is not a problem, period. Mesh floor. Ok, this was definitely my biggest hang-up with the tent since the very first time I came across the Hexamid Solo tent. Since that time I have changed my thought processes some. I can see some benefits to it (weight, bug protection, water run-off from the tent not running onto my ground sheet) but that doesn’t mean that I don’t have some concerns still. Namely, durability. Although IIRC, Joe said he used the Hexamid Solo for one of his thru’s and never got a hole in it. So, I am willing to give it a try. 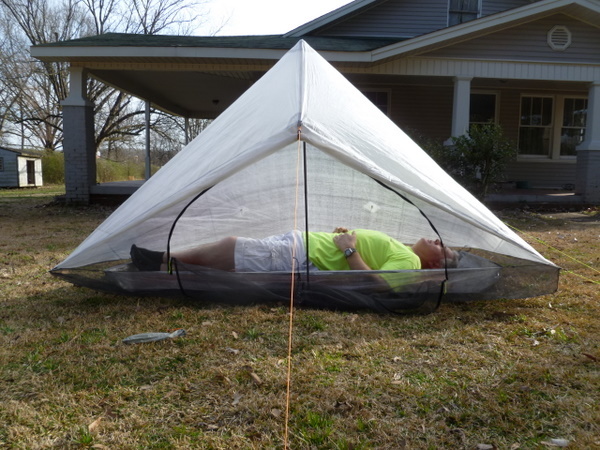 But, I will be honest here…last night as I was lying there drifting off, I was thinking about cutting part of it off…similar to the SMD Wild Oasis…leaving just enough netting to fit under the ground sheet. Anyway, the last concern I have with the mesh floor is how much junk will it absorb? I am thinking of pulling it up out of a puddle with mud stuck all in the mesh. And then, when I fold it all up I will really have a mess… But I guess at a stream I can take it out and wash it off… just stick it in the stream… I dunno, this I will have to wait and see. The final weight of the tent with 10 titanium tent stakes and a Spinn tent stake bag comes to a total of 17.7 oz. To date I have only used the tent on 4 nights. Temperatures have ranged from mid teens (F) to mid 50’s. The nights have varied between calm, windy, and as of last night (or rather early this morning) rainy. I am saying this to say up front that I do not have ton’s of experience with it, but the limited amount of use so far has been in a respectably wide range of conditions (IMO). By this I mean, other than in the dead of summer, these are the conditions in which I expect to use this tent in. Real quick, the bottom line is that I LOVE THIS TENT! I have found it to be very easy and surprisingly fast to set-up. The interior space is more than adequate, and so far it seems to protect me from the elements rather well. Despite the lack of top vents, thanks to the ventilation around the entire perimeter as well as the large amount of ventilation at the front of the tent I have yet to experience any moisture build up on the interior walls. I am not saying that it will not happen, but so far there has been none, and I feel that this is due to the high amount of air that easily passes through the tent. On the other hand, be prepared to account for a drafty tent on cold nights. So far I would compare this tent to the openness/breeziness of a tarp. However, I welcome this. I love the fact that I chose white (or clear) cuben rather than the green or the blue. Granted at 0.51 oz/sqyd none of the colors will provide complete privacy, but I really like how see-through the white is. I can kick back at night and almost see the stars (they turn out to be blurry spots, but it is rather beautiful). As well, since the edges do not tack down to the ground and the front offers a large amount of visibility when lying down (even with the beak pulled out) I can check out my surroundings with hardly a distraction. The last night of our hike when I laid down I was able to roll over on my side and watch the fire die down from the comfort of my tent (and the warm sleeping bag). There are 3 “tricks” that I have learned about the tent (which very well may not be tricks at all but rather me just learning about the tent). When setting up the tent, the 2 front corner guylines are staked down first. When staking the second guyline down Joe recommends to give it about 8″ of slack. (This allows the appropriate amount of slack to be in the tent so the trekking pole fits correctly.) I have simply marked a black line on the spectra cord at the 8″ mark. Now I always know to start with the corner where the ZPacks patch is first. (I also know that this is my front left facing corner so I can easily orient the tent.) Then the rest is easy-peasy…so make that mark to get it right the first time, every time! Before staking out the front beak guyline I stake the back center guy line down. This prevents the front of the tent from falling over when I am trying to guy out the front of the tent. When I stake out the back guyline I simply let the guyline lay limp on the ground and then stake it down about 2″ in from where the end of it lies. This has been the right amount each time. With the back staked out I can pull the front beak out and it works great! The shock cord for the beak is attached to the loop with a mitten hook at the end of the front guyline where it stakes in the ground. Up until last night I would simply attach the shock cord to the loop on the beak (with a second mitten hook) and leave it at that. However, the beak seemed to sag in a bit despite how tight I adjusted the shock cord. A light bulb went off last night…once I attach the shock cord to the beak loop, then attach it to the front guy line too… It pulled the beak out a little more. Sweet. Also, I have found that the mitten hook can be a little difficult to attach to the loop on the beak. So, I am planing to add a small spectra loop to the beak loop. The spectra is much easier to slide the mitten hook over. So, now I have 2 options. Buy some more SeamSil which I do not (will not) want to do. Or I can buy some of the tape and an extra yard of cuben from Joe and tape the tent myself. This will be the route I will go with, but first I need to save up another $60 for the tape and the cuben. Then of course I will have to actually tape it…bummer. So, I hope that this has answered some questions for those of you interested. And if my writing has merely provided confusion, maybe the following video will better explain it…If not just post or comment below and I will answer them the best that I can. A while back I picked up the ZPacks Hexamid Solo Plus Tent, which has replaced my SMD Skyscape Trekker as my solo tent. When the tent arrived it was not seam sealed, so I had to seal the tent myself. 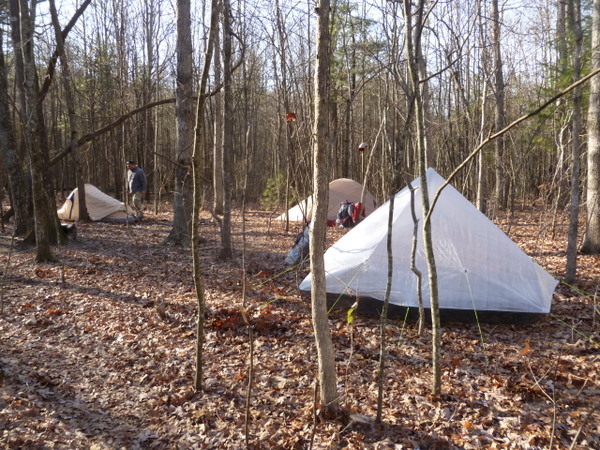 To do so, I used the tube of SilNet that Joe sends with the tent, as he does all of his tents. I found seam sealing the white cuben fiber to be a bit tedious as it was simply hard for me to see the seam sealer on the tent as I was sealing it. So, I did my very best, and hoped for the best. Well, I didn’t have to wait very long to find out how I did…the weekend before last we had a bit of a storm come through and I managed to get the tent set up in time to weather it. All-in-all, the tent did pretty well, although after about an hour of rain I noticed a few drops making their way in. As well, I realized that I should have sealed the seams at the corners due to the fact that when water saturated the seams here, the water came right on down the shock cord which attaches the bathtub floor to the tent. The water did not come into the bathtub floor because the mitten hooks created a drip point, but the water got closer than I had liked. Today my tape came in. So, I laid my tent out on the floor (per Joe’s instructions) to apply the tape and got to it. When it was all said and done I have used approximately 220″ of the tape on the tent, however, I did not tape the entire tent. I did tape the 4 corner tie-outs, the back center tie-out, all 4 of the upper tie-outs and the major seam that runs up the center of the tent on both the front and the back side. Of course I took time to tape around the reinforcements around the apex of the tent and at the center of the beak as well. The only places I did not tape is across the front seam where the beak is attached to the tent and along the 2 smaller seams that run at an angle on each side. The reason being for this is that these areas did not leak when I had set the tent up in the rain, as well, I did not want to try to tape around the area where the mesh is attached to the tent. Also, I taped everything from the inside of the tent, and this is simply because I had already applied the seam sealer to the outside and I was not sure how the tape would do if applied over the seam sealer. But, we live, we learn. And now I have a sweet tent! As you can see, he does indeed fit. However, it is close. His feet are actually almost touching the top of the tent at the foot end, but it is a little hard to see that well. However, he can still slide a few inches up towards the head end. As well, he could actually have came a few inches towards the front of the tent which would have also gave up a few more vertical inches at the end. He did not crawl into a sleeping bag for the picture, but I feel like he would be fine in a sleeping bag as long as he did not get to wild squirming around and such. I hope that this helps those taller folks that are interested in this tent out some! Hi Stick – going back, to do it again now (if you were staying with a tent, would you get the hexamid, Altaplex, Duplex, other? Related note – did the lack of a true floor in the Hexamid crest issues such as standing water, or soaked water/mud in the floor as you tried to pack up? I actually sold this tent version and went with the tarp and (no longer available) Hexanet. As it turned out I didn’t care for the mesh floor as it attracted water, dirt, mud, leaves or anything else. Besides this it was a great tent, but I like the modular aspect of the tarp and inner. Sorry it has taken me so long to get back with you… You may have already made up your mind by now, but I will still weight in… Yes, the Hexamid is slightly smaller than the Doomed, but it isn’t ton’s smaller. I will say that I like that they finally made the doors a bit longer to offer more coverage… I know there are folks that have used the Hexamid without the beak (which was shorter than the doors now) but I don’t see how… When I had my previous model Hexamid Plus Tarp with the beak, the only hang up I had with it was that I wanted the doors to stretch as low as the rest of the edges of the tarp… and now they have finally done it. As far as the doors, I like that it is now an option of opening one side or the other, but I will also admit that the way the beak raised and lowered was much simpler and easy… ah welll, I can’t have the best of both worlds I guess!!! Anyway, I may have gotten off point a little there.. sorry. Anyway, as for the Hexamid tarp, it is my favorite tarp on the market. Yes, the Duomid is sightly larger, and even offers a little more protection since it stakes to the ground, however, I love the lighter weight and how breezy the Hexamid is more (not to mention the lack of condensation due to how breezy the Hexamid is)… at least for my backpacking trips. But that is for me, and just for me… it may start to get tighter with a second person, or even a 20 lb dog… at least your dog is smaller though, so it may not make much of a difference with the dog, especially so since you are using a bivy beneath it as opposed the the larger Hexanet like I use. Anyway, good luck with your decision, if you haven’t decided already. Let me know what you decide, and how it works for you! Many thanks for the response. I thought the Bivy may have that problem. That being said, I went with a 7′ X 9′ Cuben tarp instead of the hexamid and will most likely clip up a bug shelter with covered ends set up centered under the tarp as opposed to a bivy. More room, less condensation worries, and lighter! Thanks again for the help, love your reviews. I have a few questions for you regarding the Hexamid Solo Plus and what you’re using inside it. Although this post is about the tent, I know you switched to the Tarp, something that I am also thinking of doing. I am planning an AT Thru Hike next year and I was planning to use the Hexamid Solo Plus tarp (I’m 6′ 2”), Marmot Helium 15, and Borah Gear side zip SilNy bottom bivy. I was curious as to your thoughts on this combo, since I’m fairly certain you have the same set-up. How was the moisture after a big rain, any wet spots under the tarp? I think that that set-up will work just fine, however, a couple of things to think about. I would test the bivy out as much as possible. Condensation inside the bivy (between the bivy and the top layer of the sleeping bag) is quite common. Mu suggestion is to go with a quite breathable top layer, or better yet, have a mesh window added in along the center section (so that the bottom and the sides are still protected from splatter) to help move that moisture out as much as possible. Even still, sleep with it in your yard and figure out if it is what you want. Something else to think about, the new Altiplex tarp offers a bit more protection since the front extends closer to the ground. This could be welcome in wind blown rain, even inside a bivy. It also has steeper side walls, which would give you a little more clearance along the head and foot end (which would help considering your height with a thick air pad, and the puffy Helium bag). Anyway, hope this helps some. And good luck on your thru! Question: if you were choosing today between the Skyscape X and the Hexamid Plus what would you choose if there was NO difference in weight or price (i.e. just considering functionality)?? I ask this cuz i’m in the market and you’ve been pretty keen on both of these tents at different times. Maybe you’ve already answered this somewhere… if so, just tell me where to look. Thank you for your fine contributions to our sport!! I have got to admit, dealing with the mesh on the Hexamid can be a bit of a pain once it gets wet, and especially muddy, but other than this, I have nothing bad to say about this shelter. I know that some complain about having to duck down a little to enter/exit the tent, but this is not an issue for me. It is huge for one, and can fit 2 in a pinch. It ventilates as well as a tarp set-up, which means condensation is easy to deal with, and is nice in warmer weather, which we have a lot of where I live & hike. And despite the fact that it uses 10 stakes (max) to set-up, set-up is rather easy. All around, a really great tent. I have less experience with the Skyscape being as I only owned one (and not the “X”) for a few months, and got absolutely no trail time with it. But, I can say that set-up was easier on this shelter than with any other tent I have had experience with. I loved that the poles went inside the tent, which made adjustments easy as well as pinned the floor down so that it was not free-floating. I also liked that both sides could be open for a very roomy feel, as well as good ventilation. However, on the few times I did sleep in it in the yard, I did have a little condensation with it, but not bad. Also, while it does have a “bathtub” floor, I found that in order to get the most out of the actual shape, the ends needed to be tied out rather than staked down. When staking down, it did pull the bathtub floors down a bit. Chad, What made you decide on the Hemid Solo Plus vs Heximid Solo. I am 6′ tall, a section hiker, who goes out for 3-7 days at a time. More room is what made me decide on the Solo+. On occasion I may have my son or wife out with me and if the weather is looking good I can use this rather than my heavier Lunar Duo. OTOH, I also like the extra room for myself. Being that you are 6′ tall, I would suggest the Solo+ as well, although many other 6′ users make the solo work well too. My buddy Gizmo Joe has the Solo tarp with the innernet, and I can tell you that when I put them side by side, there is a considerable difference. However, the difference is that the Solo+ is taller and wider, but the same length as the solo.